A Bresh of Freath Air!! Oh how we crave an Alaskan “bresh of freath air”…one that has so energized a certain campaign. Senator McCain is so proud of her that he glows. Now McCain and his “fellow prisoners” can revel in this bresh freath, gliding around picking daisies, shooting moose and raising arthritic pincers, forming air quotes around the phrase “health of the mother”. Oh these pro-abortion women they are Just. So. Obsessed with the health of the mother! My God! How delusional are these democrats! Another thing McCain did was put on a puppy face, or maybe a sad old dog face, while he tried to make himself look like a victim of the most negative campaigning ever seen in recent history. Yes, you read that right! 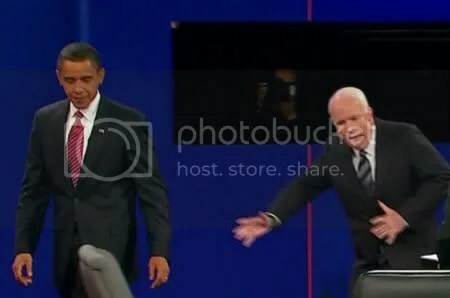 McCain feels victimized by negative campaign ads run by the Obama campaign! I don’t know if one limp wristed and weak voiced “repudiation” where McCain told a woman who thought that Obama was an Arab. “No, no ma’am, he is a decent family man”. I don’t know if that amounts to “every time”. Senator Obama hasn’t had much to repudiate from his supporters or crowds at his rally, they aren’t rabid and frothing at the mouth. They haven’t been running around accusing McCain of “palling around with terrorists” they haven’t indulged racist supporters who bring stuffed monkeys wearing McCain hats to the rally, they haven’t heard shouts of “treason”, “kill him”, “off with his head”…so who is Senator Obama supposed to repudiate? Apparently Senator McCain is very hurt by John Lewis’s statement where the name of George Wallace came up. It was an unfortunate comparison but it was meaningful in highlighting the thread of seething violence that laces McCain/Palin rallies. That crowd could be incited to violence. That is the point that John Lewis was hoping to make and it was a well made point. I think Senator McCain has secured two votes, one from Joe the Plumber and one from Joe SixPack. Women concerned about their health are certainly not going to put their futures in the hands of the mavericky team, nor are the Lily Ledbetter‘s of the world who are denied equal pay for equal work. The rest of us who care about the economy, who prioritize energy independence, health care reform and education and who feel a physical sense of ailment and sickness at the memory of the last eight years need to cast our votes in favor of an intelligent, eloquent, caring and compassionate man, the “cool hand at the tiller” who even McCain feels we need. That “cool hand” is certainly not Senator McCain. "Women concerned about their health .." – unfortunately, and not entirely due to the efforts of McCain-Palin and they GOP they represent, there aren't too many of those around. Many women continue to see themselves in the mould they have been cast of being vessels to bear and bring forth, without any concern for their own health. That is a far bigger question, but one which is relevant here since there are many women who would rather support Palin's view on abortion (or even equal pay).So apart from the Joes mentioned, there are quite a few Janes who'd go along and cast their votes for this combine. There are of course, so many other reasons as well (primarily economic)to oppose the 'Bresh of Freath Air' – hope US citizens, including women, see it that way. Just like Bush should count his lucky stars for being listed as the first candidate in the butterfly ballot as the ringleader of the "Pats trio(Buchanan. Robertson and Boone) took Gore's votes…Obama..should count his lucky star for having Bush pre-cede him.